We're best known for brewing aggressive, big-character beers, but we love a great sessionable ale as much as anyone. Most beers at the less-weighty end of the spectrum lack flavor and depth as much as they lack high ABVs, but not Stone Levitation Ale! This deep amber brew has a rich maltiness, big hoppy character, citrus overtones, and an impressively modest alcohol content for a beer with so much flavor packed into it. The beer was first released in September 2002. It's listed at 4.4% alcohol by volume and 45 IBUs. The official recipe works out to the following for a 5-gallon batch. In a 10-gallon insulated container, combine the malts with 3 gallons plus two cups of 173 degrees Fahrenheit water. Hold the mash at 157 degrees for 30 minutes. Add a gallon plus 12 cups of 182 degree water. The mixture should increase to 165 degrees. When the liquid is below the level of the grain, sprinkle 3 gallons plus 14 cups of 168 degree water over the grain to start the sparge and continue sparging. Put the wort in the brewing kettle and add water if needed to get it to the 6-gallon level. Then add another 12 cups. Bring the wort to a rolling boil. Set the boil timer for 90 minutes. Add a bag containing the Columbus hops to the kettle. If a layer of foam or scum appears on top of the kettle, skim this off and discard it. When the timer indicates that 15 minutes are left in the boil, add the Irish Moss. With 10 minutes left in the boil, add a bag containing the 0.9 ounce portion of Amarillo hops. When the boil is over, add a bag containing the Crystal and Simcoe hops into the kettle and begin chilling the wort to 72 degrees. At pitching temperature, discard all the hops and check the gravity of the wort to ensure it's at or near the target of 1.048 (12 Plato). Transfer the wort to your fermenter. Pitch the yeast or yeast starter. Try to keep the wort at the 72 degree fermentation temperature throughout fermentation. Transfer the beer to the secondary fermenter and then dry hop it. In the secondary fermenter, place a bag with 0.77 ounces of Amarillo hops. Ferment at 72 degrees for one week. Remove the hops bag and discard the hops. Check the gravity of the beer. If it's at the target of 1.013 (3.2 Plato), it's ready to bottle. If not, continue to ferment until the target is reached. Sanitize the bottles, caps, and bottling equipment. Put the 1 cup plus 3 tbsp of DME in just enough water to dissolve it. Bring it to a boil over high heat to sterilize it. Remove from the heat, cover, and let it cool slightly. Add it to the bottling bucket along with the beer. Fill and cap the bottles. When you've finished a batch of homebrew, you'll either bottle it or put it in a keg. Although they are more work, I prefer bottles because they're easier for me to store and share with friends. Buying bottles to use for homebrew can get costly - especially if your friends don't return them after they finish drinking the contents. That's why many home brewers like me use bottles recycled from micro brews and craft brews we've purchased in the store. In order to give your home brew a nicer look, you'll want to remove the original labels first. That will allow you to add your own labels later on. For Belgian and German beers, I'll often use just hot water. For most others, I'll use the method described below. Get a half-scoop of Oxi-Clean laundry stain remover (which is food safe) or a generic brand of the same material. Turn on your kitchen faucet's hot water tap and wait until it's as hot as it gets. Close up one side of your sink. Dump in the scoop of Oxi-Clean and start filling the sink with hot water. Swirl the water around to dissolve all the cleaner in the hot water. When the sink is full enough to submerge the largest bottle you're de-labeling, stop filling it. Move the faucet to the empty side of the sink. Gently set the bottle in the sink filled with cleaning solution, making sure the label side is down. Repeat the above two steps for all the other bottles you want to de-label, or as many as will fit comfortably in your sink. Wait at least 15 minutes (but 30-60 minutes is even better). Return to the sink. You'll find that many of the labels are now floating loose in the cleaning solution. Pull those out and discard them. Take a bottle that's already lost its label, and empty its contents into the sink. Hold it at an angle that will allow you to see if any adhesive is still visible. If so, scrub it with a dish scrubbing sponge (the kind that are safe for non-stick pans). The adhesive should come off. For bottles that haven't lost their labels, try peeling them off. If they're too hard to remove, you may be dealing with a plasticized (or even completely plastic) label. For plastic labels, you can let those dry and try peeling them off like you would a sticker. If that doesn't work, I usually discard the label. Some labels (like those from Ommegang and The Brew Kettle) don't come off on the first soak, but the first soak loosens the outer layer. Peel off this outer layer and let the bottles soak again. Often this will loosen the remaining label material and allow them to be removed cleanly. Always be sure to carefully and completely rinse the bottles you've de-labeled, or the cleaner will leave behind residue you won't like. The bottles you couldn't de-label should be rinsed and placed in the recycling if you don't want to use them. Many breweries today use thin plastic labels adhered to the bottles, rather than paper-based ones. The Hoppin' Frog brewery is a good example. I find that often I can remove these by filling the bottle with the hottest tap water I have and letting it sit for a few minutes. Then I run more hot tap water over the top of the label while the bottle is still filled with hot water. This tends to loosen the label, and I can then begin carefully peeling it off the bottle. Any leftover adhesive can either be ignored or scrubbed off with Goo Gone or a similar glue-removing solution. (I've heard WD-40 is good for this, but I'm not keen on getting that stuff too close to my beer.) This works for Innis & Gunn labels, too. Microwave the bottle for 30-40 seconds to loosen the "sticker" type labels, but be sure to use a heat-resistant glove or oven mitt to handle the bottle or you can get burned. Hair dryer or heat gun. As with the microwave method, a heat-resistant glove is advised. Use boiling water in your brew kettle to loosen them. Use hot water and ammonia instead of Oxi-Clean. Use hot water and bleach instead of Oxi-Clean. Fill the bottle with boiling water from a tea kettle, wait a little while, and peel off the sticker. If you've got a favorite method not mentioned here, please leave a comment describing it! Updated: August 22, 2015 to include CBC instructions and links to some of the products mentioned. A recent guest post on Homebrew Finds (a great site for picking up the occasional home brewing deal) discussed how to toast and use wood chips in a beer. The author of the post, Matt Del Fiacco, not only talks about how to toast the wood, but a number of other related topics like the different "toast levels" of wood and how they impact the flavors, and the kinds of flavors you can expect from using different types of wood in your brewing. The above should be treated as "rule of thumb" info as one tree may vary from another somewhat and react differently to toasting. To toast wood, spread it out on a foil lined cookie sheet. Preheat the oven to the desired temperature, using the temperature guidelines shown earlier. When the oven is at the right temp, put the wood in and set a timer for an hour. Check it about every 15 minutes until it hits the toast level you want, then remove it. There are different ways wood chips can be used in brewing. The author of the post suggested that you boil them for about 10 minutes to sterilize them a bit and remove some astringency, drain them, then put about a half-ounce of them in the fermenter for a week before removing them. I've personally used sterilized wood chunks (from Kentucky Bourbon barrels) and added them during the boil. This delivered quite a bit of flavor and I didn't have to fish them out of the fermenter later on. I'm told you can also boil the wood separately to make a "tea" and add this tea to the wort instead of the chips. Another method is to soak the chips in liquor (bourbon or vodka) and add this liquor to the beer at bottling. An advantage here is that you can control the level of wood flavor by controlling the amount of the liquor you add to the beer. During the creation of a wort, a group of proteins is formed that will show up when the beer is chilled to drinking temperatures. This "chill haze" does not affect the flavor of the beer, but does make the beer appear cloudy or hazy. For darker beer styles like a porter or stout, the haze might not be visible. For lighter styles like pilsners, this haze might be undesirable. Fortunately, it's easy to remove chill haze from a beer. During the boil of your wort, it's important to boil vigorously. This will help to coagulate many of the proteins that form chill haze. This is what is known as the Hot Break. When you're finished boiling the wort, gently stirring it in a "whirlpool" fashion with a sanitized spoon will cause the coagulated proteins and other particles of trub to collect in the middle of the kettle. If you carefully remove the wort from the kettle, you can leave these undesirable proteins behind, resulting in a clearer beer. At the end of the boil, it is necessary to quickly cool the wort to yeast-pitching temperatures in order to begin fermentation. While you could seal your beer in an airtight, sanitized vessel and leave it alone until it reaches those temperatures, you are taking a big risk. While the beer is spending hours cooling down, the proteins we're talking about will remain in the wort and a number of unpleasant and undesirable sulphur compounds will be produced. These compounds include dimethyl sulfide (DMS) which gives the beer off-flavors and an aroma similar to cooked or creamed corn. To avoid chill haze and undesirable sulphur compounds, it's important to chill your beer from boiling temperatures to yeast-pitching temperatures as quickly as you can. This causes what is known as the "Cold Break" which helps those chill haze proteins fall out of the wort so they don't end up in the finished beer. A Cold Break will also prevent the formation of those unpleasant sulphur compounds like DMS that will damage the flavor of your beer. For small batches of 1-2 gallons, you can achieve Cold Break by submerging your brew kettle or a similar-sized sanitized vessel into an ice water bath. The ice water will quickly chill the wort and give you the Cold Break you need. 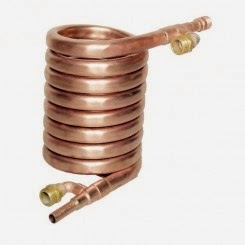 Immersion Chillers: These are copper or stainless steel tubes formed into a coil shape. Rubber or plastic hoses are attached at each end of this coil. The immersion chiller is placed in the brew kettle during the last 15 minutes of the boil to ensure that it is sterilized. When the boil is finished, cold water is pumped through the immersion chiller sitting in the hot wort. Heat from the wort is transferred to this cold water and pumped out the other side of the chiller. When it comes out of the chiller, the water will (at first) be very hot and later will begin to cool down. An immersion chiller using only cold (50 degrees Fahrenheit) tap water can chill a 5-gallon batch of beer in a manner of minutes, achieving a good Cold Break. 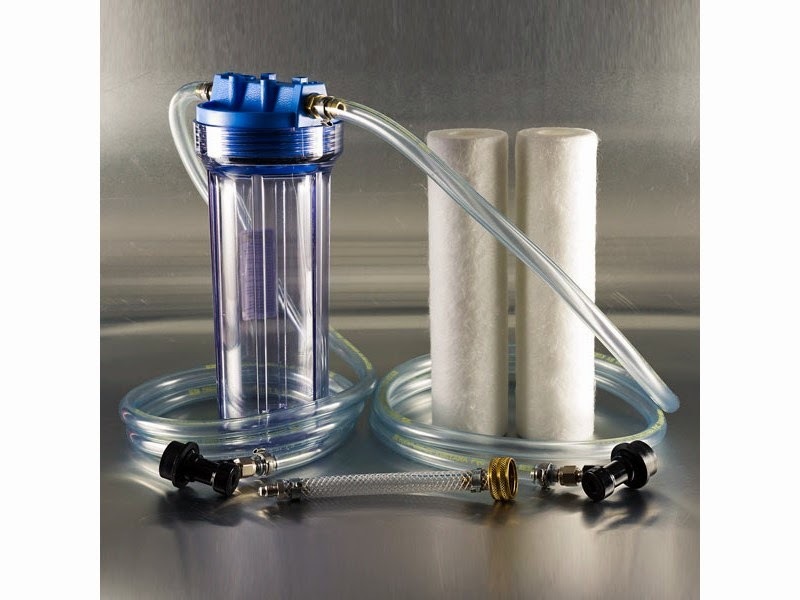 Immersion chillers can usually be hooked up to a faucet or garden hose to supply and pump the cold water, but can also be used with a reservoir of water and an electric pump (such as an aquarium pump). While the outside surfaces of the chiller must be sterilized before use, the cold water flowing through it does not have to be sterile as it never makes contact with the hot wort, only the inside surface of the chiller. 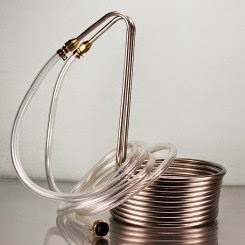 Below is a picture of the immersion chiller I use, called the "Silver Serpent". You'll more commonly see these made of copper. Plate-Style Counterflow Chillers: These use a series of copper plates to keep water and wort separate, and provide what is probably the fastest wort-chilling available. As such, these are also the most expensive chillers, requiring at least a pump for the hot wort if not also for the cold water. 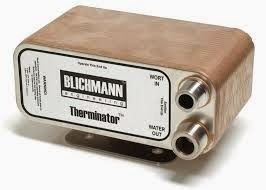 Below is the Blichmann Therminator counterflow plate chiller. Personally, I prefer the immersion style chillers over the counterflow chillers. My reason for the preference is the ease with which an immersion chiller can be cleaned. When you finish using your immersion chiller, you drain the cold water out of the inside, then clean the outside with a brewer's wash or sanitizer. Then it's ready to use. This takes about as long as cleaning a typical soup pot after heating a batch of Campbell's Chicken Noodle. Counterflow chillers require a more involved cleaning process. After you use them, you need to mix up a cleaning solution that doesn't harm your pump or lines. You then pump this cleaning solution through the pump, the hoses, and the counterflow chiller. If you don't do this, particulate matter from your current wort will remain in the chiller. This matter could contaminate your next batch of wort, causing off flavors or bacterial infection. Since you can't really see inside a counterflow chiller, you can't really be "sure" that you've cleaned it completely. By comparison, you can see the outside of an immersion chiller and any (obvious) particulate matter. You'll be able to easily scrub that off. And when you make your next batch, the chiller goes into the boiling wort where any bacteria or wild yeast is killed off. If you're aiming for a very clear and bright beer, you can improve a bit on the results from a good wort chiller by adding substances to your beer that don't affect the flavor but do remove the proteins that can cloud it. These are called "finings" and are available at most homebrew supply stores. Finings are usually added to the wort near the end of the boil. They cause the undesirable proteins in the wort to coagulate and fall out of suspension. When combined with a good Cold Break, finings can go a long way toward making your home brew look at clear as a commercial craft beer. Irish Moss: This is a red seaweed or algae. They're more common in ale brewing than lager brewing. Irish Moss drops out of the wort along with the proteins it binds to. You'll usually use a half-teaspoon of this in a 5-gallon batch of beer. Whirlfloc: This is a product produced by Kerry Bio-Science, and is also derived from seaweed. (It's basically a concentrated form if Irish Moss.) It comes in granular and tablet form. One tablet is added to a 5-gallon batch. Gelatin: Clear unflavored gelatin from your local grocery is also a fining agent. It reduces both proteins and polyphenols (which give beer an unpleasant bitter, astringent flavor). Add a teaspoon to a cup of hot (not boiling) water and gently mix it into the fermenter. Wait a few days and then bottle the beer. PVPP (Polyclar): This is a powdered plastic that is very effective at removing polyphenols from finished beer. Two tablespoons are used per 5 gallons, mixed with a cup of hot water, then gently stirred into the fermenter. It needs 4-5 days to finish working before bottling. Silica Gels (Chillguard): This silica gel is used in the fermenter a few days before bottling. Dissolve a half-teaspoon in a half-cup of hot (but not boiling) water and mix it with the five gallons of beer in the fermeneter. Isinglass: This is made from the dried swim bladder of fish, and is used primarily by commercial brewers. It helps the yeast to quickly drop out of suspension and clarifies the beer. Directions vary on the use of it, so follow the directions that came with yours. It's common to use a half-teaspoon mixed with a cup of hot water per 5 gallons of beer, and it needs 4-5 days to complete its work before bottling. Finings are relatively inexpensive and easy to use, having no impact on the beer's flavor while making it much clearer and brighter. Some homebrewers eschew the use of finings because they remove proteins and yeast, and thus some of the nutrients, from the beer. There is no requirement that you use finings in your brewing activity, so feel free to use or omit them as you wish. Finings are relatively inexpensive, costing only a few dollars for enough to clarify several batches of beer. Combined with some of the other tools and techniques described here, they may get your beer close to commercial levels of clarity. In lager brewing, chilling beer to temperatures in the 30-32 degrees Fahrenheit range for a period of four to six weeks will make a much clearer beer without the need for finings. Ales can be cold conditioned as well. This is typically done for a period of a week or so in refrigerator-style temperatures. There seems to be some debate on this, but some brewers claim that if you remove the beer from the trub in the primary fermenter and move it to a secondary fermenter you will have a clearer finished beer because you leave all that potentially-clouding material behind. More recently, I've seen experiments that indicate the opposite, that trub actually helps to clarify the beer and improve its flavor. So as far as I'm concerned, the jury's still out on this. Personally, I don't use a secondary fermenter and I've never felt my beers were unnecessarily cloudy. (Then again, I tend to brew a lot of darker styles where haze might be harder to spot.) You'll have to do your own experiments here and come to your own conclusions. Another way you can create a clearer beer is to choose a different yeast strain for fermentation. The term "flocculation" is used to describe how well the yeast moves out of suspension when it's finished fermenting. A yeast with low flocculation will leave a beer cloudy. You see this in German wheat beers and Belgian wit beers. A yeast with high flocculation will drop out of the beer when it's finished doing its job, leaving a clearer beer behind. For some beer styles you may need or want a low-flocculation yeast in order to achieve the right flavor and cloudy appearance. For others, if you want a clearer beer, choose a yeast that flocculates highly and you'll automatically have a clearer finished product. The manufacturer of this product claims that it will "wow your friends and family with the absolute commercial quality of your homebrew" and will "filter out suspended yeast and particulates for startlingly bright beer". This filter sells for approximately $80 at the time of this writing. The down-side to filtering is that by removing most of the yeast from your beer, you remove (or at least complicate) the option of natural carbonation in the bottle. Using a filter system like this, you'll most likely need to keg the beer and inject carbon dioxide into it. There are many ways to achieve a clearer finished beer, as we've discussed. Most of these are relatively inexpensive and can deliver good results.